The eastern gorilla (Gorilla beringei) is a critically endangered species of the genus Gorilla and the largest living primate. The species is subdivided into two subspecies. Grauer's gorilla, formerly known as the eastern lowland gorilla (G. b. graueri) is more populous, at about 3,800. 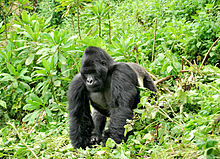 The mountain gorilla (G. b. beringei) has only about 880. Illegal hunting of these gorillas are the reason why they may go extinct. ↑ Plumptre, A.; Robbins, M.; Williamson, E. A. (2016). 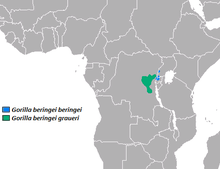 "Gorilla beringei". IUCN Red List of Threatened Species (IUCN) 2016: e.T39994A17964126. http://www.iucnredlist.org/details/39994/0. Retrieved 5 September 2016. ↑ "Gorillas on Thin Ice". United Nations Environment Programme. 15 January 2009. Archived from the original on 18 May 2016. Retrieved 19 May 2010. : "The Eastern Lowland Gorilla population in the DRC has plummeted dramatically over the last 10 years, with probably only about 5,000 of the formerly 17,000 animals remaining." ↑ "The Eastern Gorilla listed on Red List of Endangered Species by IUCN". CBSnews. AP. September 4, 2016. Retrieved September 4, 2016. ↑ "Four out of six great apes one step away from extinction – IUCN Red List". 4 September 2016. This page was last changed on 21 June 2018, at 07:47.